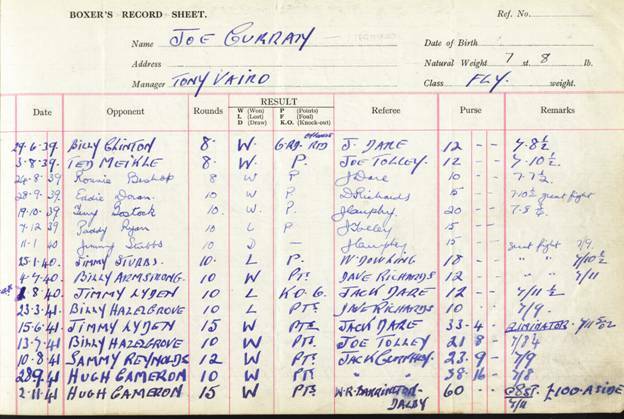 Joe Curran was born in Liverpool on 27 April 1915, he boxed in an age when flyweight boxers were plentiful and champions were a household name. At this time British boxers dominated the flyweight division with boxers such as Jackie Brown, Benny Lynch, Peter Kane, Jackie Paterson and Rinty Monaghan all winning the world championship. Joe’s amateur career was short lived. He started boxing at 12 years of age at St. Joseph’s ABC later moving to Transport House and then on to St. Peter’s ABC. He was beaten in the final for the Lancashire and Cheshire 6st 7lbs Championship. Turning professional at the young age of sixteen, Joe came under the guidance of Dom Vairo. 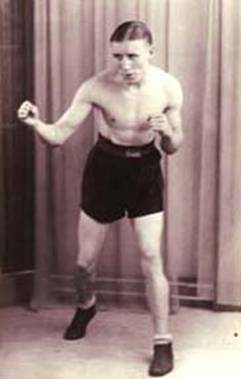 His first fight was at the Drill Hall, Birkenhead against Joe Hartley, 27 May 1932, whom he knocked-out in the second round. Joe felt comfortable in the professional game and gradually built up a good record. In 1936 Dom Vairo thought that Joe should step up in class, consequently his next opponent was to be Peter Kane the Golborne blacksmith, who was later to become the World Champion. The fight took place at Warrington Baths on 24 January 1936 with Kane winning the ten round contest on points. This was the first of a trio of battles with Kane, all of which Curran lost. The second took place at the Liverpool Stadium on 26 April 1942, with the third being held at Anfield in August of the same year. In the third bout Joe was knocked-out in the 11th round. Joe reckoned Kane to be his toughest opponent. Joe was proud of a memento he received after out-pointing Dave Keller at the Devonshire Club, Hackney on 19 February 1937. His performance was judged to be an outstanding display of boxing. The Certificate he received is highly prized and awarded by the Boxing Board of Control. On 10 July 1946, at the age of 32, Joe was matched with Jackie Paterson at Hampden Park Glasgow for the World, British and Empire Titles. There was an estimated crowd of 66,000 people present. After losing on points Joe felt disappointed with his showing. His form had deserted him and he was clearly out of touch. With hindsight he concluded that the two-year gap between him beating Norman Lewis of Wales in the final eliminator for a crack at the titles was too long, but as Joe was aware these things can be stage-managed to favour a champion. A story Joe often told would go down well in any sporting company, followed a fight he had taken at short notice and had surprisingly been knocked-out. It transpired that Joe had only returned home from sea on the Tuesday, prior to taking a fight at the Stadium on the following Thursday, after a hair-raising experience at sea. The fight in question took place in 1941, the war was then in its infancy. Joe had been working as a fireman on a merchant ship, named the Lancastria, which was involved in a rescue mission off the coast of France. Following the evacuation of Dunkirk they had on board French civilians, women and children along with British soldiers. Whilst the rescue work was in progress they were continually harassed by German aircraft bombing and strafing with machine guns. The Lancastrian eventually succumbed to the bombs and Joe spent five hours in an oily sea before being rescued. I guess the fight was small beer compared to such an experience. It would be interesting to know if Johnny Best accordingly adjusted Joe’s purse once having heard the reason behind his lacklustre performance. The action in which Joe found himself embroiled is still subject to the Official Secrets Act until 2040. It was 1948 three years, after the end of hostilities with Germany, that Joe decided enough was enough and another glorious boxing career came to an end. The final bell tolled for Joe in 1984 after a career marred by war but matched by courage.